What do excited students, craft projects, room mothers, nursing home visits, harried shopping, and near-disastrous pageants have in common? They are all a part of a teacher’s pre-Christmas experience. In this energetic romp through a school’s last days before the Christmas break, the students are full of energy and are up to all manner of mischief. But the teachers are pulling out their hair trying to keep the students busy, while they despair over their own Christmas preparations. Who should come to the rescue? Santa himself, of course! And he arrives at the helm of a flying school bus, with presents for all the teachers and a promise to take care of their shopping for them. The fantastic illustrations work with the text to make this a fast-paced, high-energy comedic interpretation of Clement C. Moore’s classic poem. 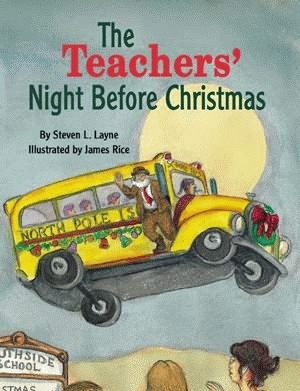 The book is sure to be a read-aloud favorite at Christmas parties in schools everywhere. Steven L. Layne is a junior-high language arts teacher in Oak Brook, Illinois, and an adjunct faculty member in the Department of Curriculum and Instruction at Northern Illinois University. He is a member of the International Reading Association, the College Reading Association, and the Northern Illinois Reading Council. He is a recipient the ICare Reading Award, presented by the State of Illinois Council for Affective Reading Education in 2000, and in 1999 was named the Junior High Reading Educator of the Year by the Illinois Reading Council. He is also author of Thomas’s Sheep and the Great Geography Test. Widely acclaimed as the South’s leading illustrator of juvenile books, James Rice is the illustrator and/or author of fifty-plus titles with over 1.5 million copies in print. Rice was born on a farm in Coleman County, Texas, and currently resides in Hico, Texas. He has taught art at the grammar school, high school, and university levels, and enjoys talking to schoolchildren across the country about writing and art. 31 color illus. 3rd ptg. "Favorite teachers in your life . . . should get a kick out of this playful romp with a heartfelt ending." Click here for the study guide for this book.